Today’s news release announced that the merger is complete. As of today, the new company is operating as Johnson Controls International, plc with headquarters in Cork, Ireland. With that, this “ongoing discussion” comes to an end. Time to move on. The news about the announced merger of Johnson Controls, Inc and Tyco seems to be coming in spurts with a bit of politics mixed into the business and investment impact of the planned merger. Our intent is to serve our membership by passing along those stories that offer information on the business and investment impact of the merger. With that purpose, this News posting contains links to published stories and news releases addressing the merger. It will be updated as we find articles that may be of interest to our members. The list here certainly won’t be comprehensive. If you find an article that you think may be of value to other members please send us the link via Message to the Editor at Join the Discussion. Nobody knows just how this will all turn out. If we continue to share information, perhaps we can be better prepared as it evolves. 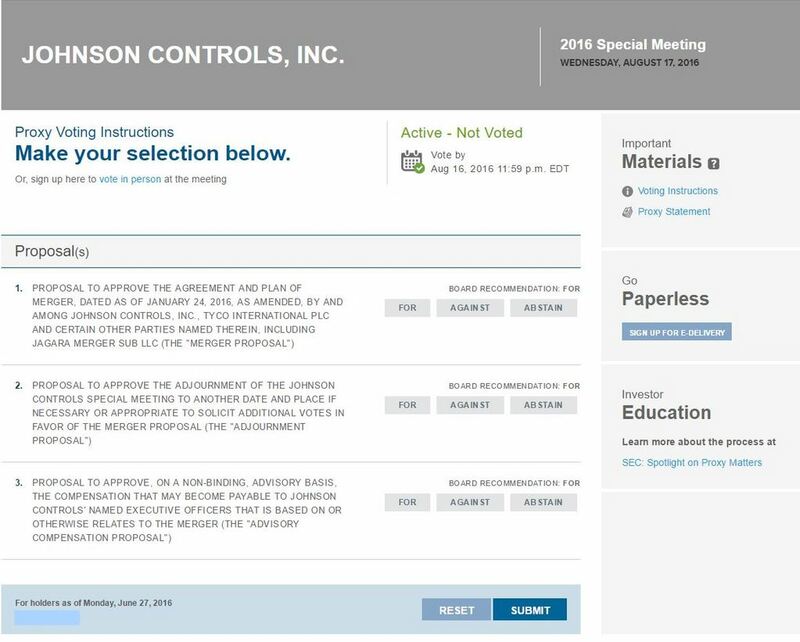 Aug 09 — Johnson Controls settles lawsuit over Tyco merger, BizTimes …..
“The Johnson Controls filing says the settlement will not affect the consideration to be paid to company shareholders. The lawsuit said that any tax benefit from moving the combined company’s headquarters to Ireland would be outweighed by Johnson Controls shareholders having to pay taxes on their gains from the merger. “The inversion will force thousands of JCI shareholders to dig into their pockets and pay taxes on their gains just to remain shareholders,” the lawsuit says. Jul 21 — Johnson Controls Q3 Fiscal Quarterly Update; noted changes: accelerated schedule for merger to be effective September 2; Adient to be domiciled in Ireland. Jul 12 — Notice received from the holder of the editor’s stock that “Proxy Voting Material is Ready for Your Action.” It contained a link to the Proxy Statement and utility for voting online. Click on the image of “Example Online Proxy Vote Form” above to read the proposal details. Jul 7 — Press Release to PRNewswire from Johnson Controls regarding the filing and date of the meetings. Also, more information on the parties involved in structuring the merger agreement.